Our crib in Wanaka came with an old peach tree which produces fruit that tastes as peaches should – sweet and juicy. I picked some when I was there at the weekend, enough for us and some to share. Today I’m grateful for a tree that produces peaches that taste like peaches and in abundance. Prothalamion – song or poem written in celebration of a forthcoming marriage or wedding. A woman who continued to farm after ending her abusive marriage has spoken out in the hope it may help others in similar situations. Police say just three in 10 women will report domestic abuse, while seven will remain silent. Claire* farms in the central North Island and said domestic violence in rural communities was a taboo subject that people turned their backs on. Claire was happily married, living the dream on the farm she had always wanted to own. Within 18 months of the relationship beginning their first baby came along and her husband’s three children from a previous marriage joined them at the farm. . . Sometimes it’s about taking those first steps. When North Otago dairy farmer, vet and mother-of-two Nicola Neal completed the two-day First Steps programme in 2014, it gave her a firm sense of direction. The programme, developed by the Agri-Women’s Development Trust, is specifically designed to help rural women understand and realise their potential. . .
Young mothers living in the rural backblocks have a new champion. Twenty-six-year-old mother-of-two and wife of a deer farmer, Chanelle O’Sullivan, saw a need for a support mechanism for young mums, often from an urban background, who found themselves ensconced in the countryside because of their husband or partners’ jobs. “These girls are often isolated and unsupported,” O’Sullivan says. “I wanted to create a means for them to interact, hence I took over the Farming Mums NZ Facebook page three years ago. I thought it was a worthwhile resource for women who could otherwise feel isolated in the country.” . . The clincher for Manawatu dairy farmer to change his farm business for the better was seeing a previously enthusiastic young employee struggling under pressure. As an owner of a 1000-cow farm in Bulls, Manawatu, Stuart Taylor has a team of six to seven staff. Integral to his business is creating a community of good, productive people, with individual roles reflecting what they want out of a career and an opportunity to get to where they want to be. . .
(BusinessDesk) – Seeka Kiwifruit Industries, the largest kiwifruit grower in Australia and New Zealand, increased annual profit 35 percent as volumes recover from the impact of the Psa-V vine disease and it received insurance money from a fire at its largest packhouse facility. Profit rose to $4.3 million, or 27 cents per share, in the 12 months ended Dec. 31, from $3.2 million, or 22 cents, the year earlier, the Te Puke-based company said in a statement. That’s ahead of its forecast of between $2.96 million and $3.53 million, which reflected uncertainty around insurance claims related to the fire. It received $5.46 million in insurance proceeds from the fire, although not all claims were finalised or accepted by the insurers at year end. Revenue rose 23 percent to $142.1 million. . .
Two of Hawke’s Bay’s biggest apple exporters have teamed up to store apples, today opening the regions largest single rooms coolstore. Bostock New Zealand and Mr Apple have officially opened their new 8600m2 coolstore near Flaxmere, which has the capacity to store 30,000 bins. Bostock New Zealand Owner, John Bostock says it’s very exciting to be opening a state of the art facility, which has the technology and innovation to provide customers with full traceability from the Hawke’s Bay orchards to consumers across the world. . .
Two of Hawke’s Bay’s biggest apple exporters have opened the region’s largest single rooms coolstore. Bostock New Zealand and Mr Apple have officially opened their new 8600 square metre coolstore near Flaxmere, which has the capacity to store 30,000 bins. Bostock New Zealand owner John Bostock said the state of the art facility had the technology and innovation to provide customers with full traceability from the Hawke’s Bay orchards to consumers across the world. . .
Act leader and sole MP David Seymour’s first shot at the party’s conference this weekend was to pot the Greens for hypocrisy for having the highest expenditure on flights. The figures come from the fourth quarter parliamentary expense reports. It excludes ministers who have a much heavier workload, for example the Ministers of Health and Education must visit hospitals and schools, and are reported separately. In October, November, and December the average Green MP spent $8,562 on air travel. By comparison the average Labour MP spent $7,790, the average National MP $5,933 and the average New Zealand First MP $6713. . .
“These are the MPs who regularly tell us that climate change is the crisis of our time and we must reduce our emissions. “It is also extraordinary that they do not even have to serve electorates, as the Greens are all list MPs and have not won an electorate since 1999. As an Auckland electorate MP I have to see constituents on Monday and be in Parliament on Tuesday, and back in the electorate Friday, practically every week. “As list MPs the Greens have far more potential to minimise their carbon footprint by flying less, but not only have they not done so, they are the most frequent flyers. He then went on to out-green them with proposal to sell Landcorp and put the proceeds into a Sanctuary Trust for applicants who wish to operate inland sanctuaries for native wildlife. “Landcorp is a business the Government should never have owned and which is responsible for considerable dairy conversion and deforestation. “The new Trust’s grants would be conditional upon the applicant reaching targets for predator exclusion, biodiversity, and community participation. “The model is not so very different from what ACT has done with Partnership Schools. Invite social entrepreneurship, measure performance according to agreed targets, and get out of the way. “Over 100 years, Sanctuary Trust would radically transform the abundance of New Zealand’s most endangered species.” . . .
Utopia has a graph showing Landcorp’s dividends paid and cash injections received from government since 2007. 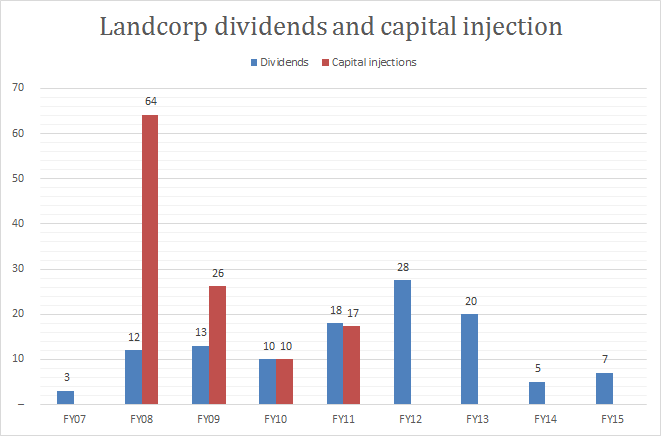 As cash cows go, Landcorp has had $2.25 million more in capital injections from taxpayers than it returned to them in dividends since 2007. Source: data released by the New Zealand Treasury under the Official Information Act. The $1.5 billion asset is a very poor investment for the taxpayer. Keeping some of the farms as a land bank for treaty settlements has merit. But the rest could be sold, gradually so as not to flood the market. Using some of the proceeds for environmental projects such as Seymour proposes and some for investing in agricultural training and infrastructure, for example irrigation development, would be much better use of the money. Concern for the environment is not the preserve of the political left. There is a significant constituency of people who are green but not Green. They want sound environmental policies without the radical left social and economic agenda. Some of those support National’s Blue Greens but some let their green leanings blind them to the red social and economic policies of the Greens. Seymour is targeting them and in doing so attempting to grow the centre right share of the vote. He’s out-greening the Greens with environmental policy that makes economic sense. I never wanted to set the world on fire. So I never had to burn any bridges behind me. – Dinah Shore who was born on this day in 1916. 1504 – Christopher Columbus used his knowledge of a lunar eclipse that night to convince Native Americans to provide him with supplies. 1704 – Queen Anne’s War: French forces and Native Americans stagd araid on Deerfield, Massachusetts, killing 56 villagers and taking more than 100 captive. 1712 – February 29 was followed by February 30 in Sweden, in a move to abolish the Swedish calendar for a return to the Old style. 1720 – Queen Ulrika Eleonora of Sweden abdicated in favour of her husband, who became King Frederick I. 1796 – The Jay Treaty between the United States and Great Britain came into force, facilitating ten years of peaceful trade between the two nations. 1864 – American Civil War: Kilpatrick-Dahlgren Raid failed – plans to free 15,000 Union soldiers being held near Richmond, Virginia were thwarted. 1892 – St. Petersburg, Florida was incorporated. 1904 – Jimmy Dorsey, American bandleader was born (d. 1957). 1904 – Wolfe+585, Senior (alleged date), German-born American typesetter who had the longest personal name ever used, was born, (death year unknown). 1916 – Child labour: In South Carolina, the minimum working age for factory, mill, and mine workers was raised from twelve to fourteen years old. 1932 – Time magazine featured eccentric American politician William “Alfalfa” Murray on its cover after Murray stated his intention to run for President of the United States. 1936 – Baby Snooks, played by Fanny Brice, debuted on the radio programme The Ziegfeld Follies of the Air. 1940 – For her role as Mammy in Gone with the Wind, Hattie McDanielbecame the first African American to win an Academy Award. 1940 – Ecumenical Patriarch Bartholomew I of Constantinople was born. 1940 – In a ceremony held in Berkeley, California, because of the war, physicist Ernest Lawrence received the 1939 Nobel Prize in Physics from Sweden’s Consul General in San Francisco. 1944 – World War II: The Admiralty Islands were invaded in Operation Brewer led by American General Douglas MacArthur. 1952 – The island of Heligoland was restored to German authority. 1956 – U.S. President Dwight D. Eisenhower announced to the nation that he was running for a second term. 1960 – An earthquake in Morocco killed over 3,000 people and nearly destroyed Agadir in the southern part of the country. 1960 – Family Circus made its debut. 1964 – Opening of first road to Maungapohatu. 1964 – In Sydney, Australian swimmer Dawn Fraser set a new world record in the 100-meter freestyle swimming competition (58.9 seconds). 1972 – Vietnam War Vietnamisation – South Korea withdrew 11,000 of its 48,000 troops from Vietnam. 1972 – Hank Aaron became the first player in the history of Major League Baseball to sign a $200,000 contract. 1980 – Gordie Howe of the then Hartford Whalers made NHL history as he scores his 800th goal. 1984 – Canadian Prime Minister Pierre Trudeau announced he would retire as soon as the Liberals could elect another leader. 1988 – South African archbishop Desmond Tutu was arrested along with 100 clergymen during a five-day anti-apartheid demonstration in Cape Town. 1988 – Svend Robinson became the first member of the Canadian House of Commons to come out as gay. 1996 – Faucett Flight 251 crashed in the Andes, killing 123 people. 2004 – Jean-Bertrand Aristide was removed as President of Haiti following a coup. 2008 – The United Kingdom’s Ministry of Defence decided to withdraw Prince Harry from a tour of Afghanistan “immediately” after a leak led to his deployment being reported by foreign media. 2008 – Misha Defonseca admitted to fabricating her memoir, Misha: A Memoire of the Holocaust Years, in which she claimed to have lived with a pack of wolves in the woods during the Holocaust. 2012 – Tokyo Skytree construction was completed, the tallest tower in the world, 634 meters high, and second tallest (man-made) structure on Earth, next to Burj Khalifa. Having a discussion with someone who shares your views is comfortable. Having a discussion with someone who doesn’t can be challenging but also useful if it either confirms your opinion or changes it. Today I’m grateful for challenging discussions. You are currently browsing the Homepaddock blog archives for February, 2016.